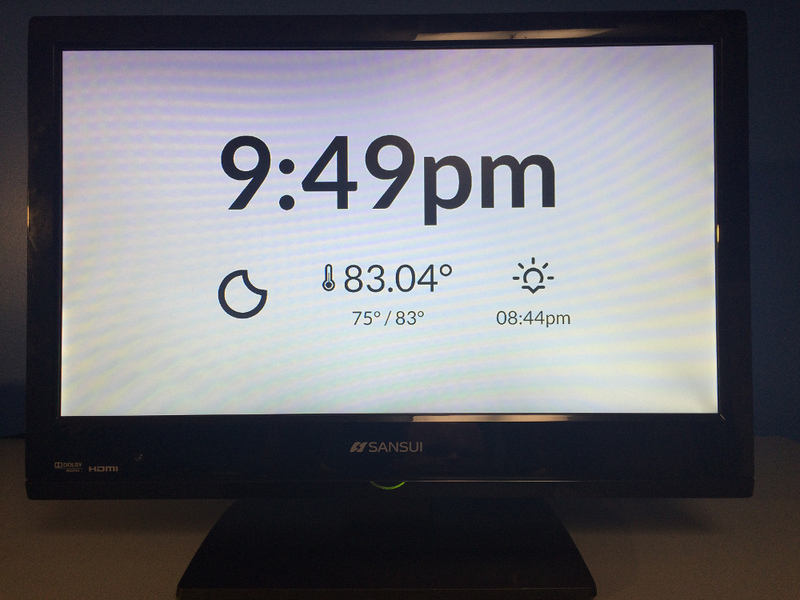 This is a very simple clock and weather page for Raspberry Pi. I needed a clock in my office and had a spare (cheap) flat-screen TV and a raspberry pi, so this was born. It shows the current time, weather conditions (via Erik Flower's beautiful weather icons), current temperature (using the OpenWeatherMap API), low temp, high temp, and sunset. I'm using Raspbian -- you can use any distro, but YMMV. Install Ruby 2.2.2 on your Raspberry Pi. I used RVM, but you can do it however you want. Clone this repo or download the tarball and expand into your home directory on the Pi. The GEM_PATH stuff and full path to ruby is because I used RVM. You might only need the ruby app.rb & part. Notice that it sleeps for 30 seconds. This was me being generous because it takes several seconds for my Pi's wifi adapter to connect to the network. Boot the Pi and see if it works! The weather icons are licensed SIL Open Font License 1.1. All other code was written by me and is public domain. Use it as you wish.